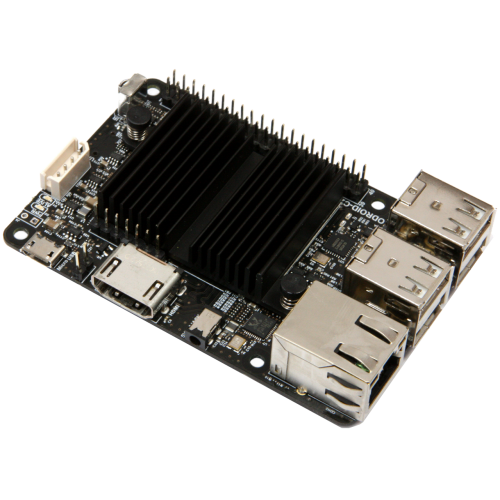 The ODROID-C2 has many advantages over the Raspberry Pi3. The processor is an S905 ARM-64bit 1.5GHz Quad-core with 2GByte DDR3 RAM, Gigabit-Ethernet and IR-receiver. The size of this computer is still only 85 x 56 mm with a weight of 70g, and offers silent operation, 2~5W average power usage, and instant portability, since it fits in a shirt pocket. The ODROID-C2 also has a 40+7pin GPIO header to make a physical interface between the board and the outside world. The 40+7pin interface headers include PWM, I2C, I2S, UART, ADC and GPIO function. The IR receiver and ADC features on the ODROID-C2 offer many options for building great DIY projects. for ODROID-C2 (inc microSD Adapter)Click here to viewPre-installed Android 5.1 or la..
for ODROID-C2 (inc microSD Adapter) Click here to viewPre-installed Xubuntu 16.04 or ..